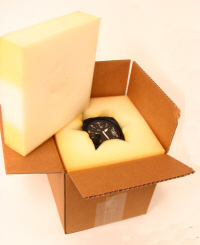 Be careful to package your instrument with at least 3" of foam rubber or soft packing material (see photo below). It is very important to protect your instrument so that it arrives at our facility in repairable condition. When you ship your instrument to us, be sure to include your name, address and phone number(s), and note which type of service you are requesting. We send your instrument in packaging designed protect it. When you receive your instrument, please inspect it and immediately report any visible damage. Please keep your original shipping package and documents until your instrument is installed in the aircraft and tested. You have 2 weeks to complete the exchange. If returning an instrument to us, or sending one in for warranty service, it MUST be shipped by air freight only! No shipments by ground service or Parcel Post! Please use the same packing that we shipped it in, or ship the instrument inside at least 3" of foam-rubber packing material. All items being returned for Warranty Service MUST be double-boxed -- NO EXCEPTIONS. Failure to comply with this requirement will void the warranty. No warranty exchanges are allowed after 90 days from the date of purchase. After 90 days, units must be returned for warranty service, and will be returned to the customer when repaired. All Overhauls carry our one-year "no-hassle" warranty, for a year from date of our invoice.